The 16th Karmapa's parents. Photographer unknown. 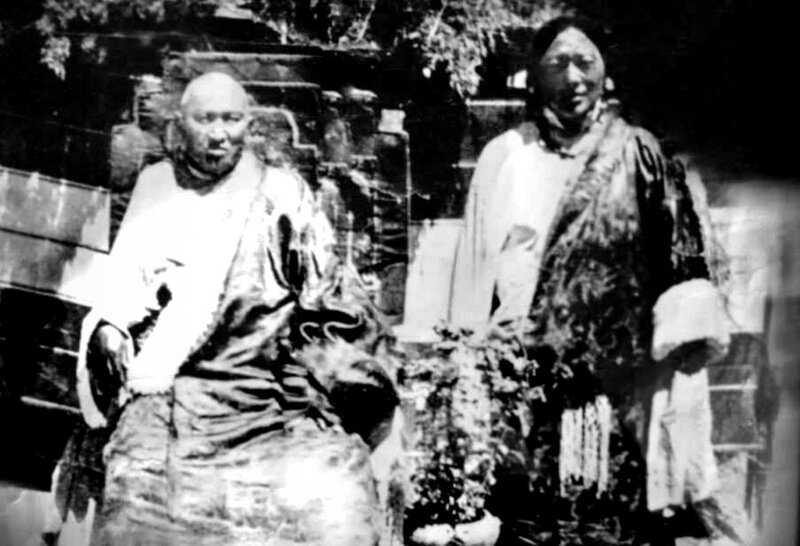 In 1923, not even two years after the parinirvāṇa of the 15th Gyalwa Karmapa Khakhyab Dorje, the abbot of Dzogchen monastery, Rinpoche Tsewang Norbu, visited a couple who were highly regarded throughout all of Derge province in eastern Tibet. Päldjor Tsewang Norbu, himself a Lama, was a minister in the King of Derge’s cabinet and his wife Kaltsang Chödän was considered a worldly dākinī. * Dzogchen Rinpoche was the couple’s root lama,* and when he arrived at their lordly dwelling in Denkhok, they welcomed him with full honors and the highest Tibetan etiquette. Since he was such an uncommon child, Dzogchen Rinpoche advised Kaltsang Chödän to go into retreat during her pregnancy and to give birth not in the Athub palace but in a cave of Padmasambhava, the Lion’s Sky Castle, which was not far away. Padmasambhava* had practiced there in the 8th century, profoundly blessing the place. Thus, as the birth approached, Kaltsang Chödän and Päldjor Tsewang built a large tent in the flower meadow in front of the holy cave. At dusk on July 16th 1924 the 16th Gyalwa Karmapa Rangjung Rigpe Dorje was born,* the event being accompanied by numerous auspicious signs typical for the birth of a great master. Rainbows appeared in the blue sky; soft rain showered down, and some saw a rain of flowers; the earth trembled softly and the water in the tent’s offering bowls turned into milk. Neither the pregnancy nor the birth itself had caused the mother any pain. Like many of his previous incarnations, according to the legend, Karmapa walked seven steps in every direction. Proclaiming “Mother, I will not stay,” he announced his fearless character, that of a great Bodhisattva.